Music, it has been said, is the universal language of mankind. Which is why is it all the more important that the music that we bask in is rousing and magnificent. 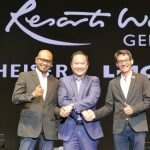 With the recent installation of the new L-Acoustics K2 sound system at the Arena of Stars, Resorts World Genting is once again raising the bar for sonic bliss in Malaysia, ensuring that the music delivered by the arena’s star-studded list of international performers is clear, crisp and comprehensive. 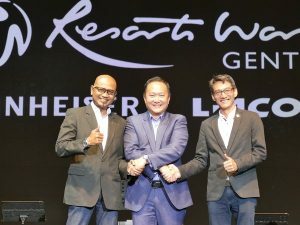 Having made its public debut at the recent Il Divo Timeless Tour Live in Genting last month, a few select guests of Resorts World Genting got a chance to experience this state-of-the-art sound system up close and personal. Represented by Sennheiser Asia in Singapore and Malaysia, L-Acoustics is a French professional audio specialist that is driven to continuously engineer an unforgettable audio experience for listeners through equipment under its L-Acoustics, L-ISA, Blububbles and Simea brands. Guests were introduced to the technical prowess and full product range of L-Acoustics through a captivating presentation, with a specific focus on the L-Acoustics K2 system adapted for Arena of Stars which showed how the venue was mapped out with the system. The installation of the L-Acoustics K2 system into the Arena of Stars took incredibly meticulous planning to create and integrate, since it had to conform to the existing layout and infrastructure of the cherished stage. Four K2 array clusters — two 12-box arrays at the front, and two 10-box arrays at the sides — ensure that the sound of musical superstars such is projected outwards to the audience with beautiful precision. Four stacks of L-Acoustics K1-SB subwoofers bring the music’s bass to life, while eight KARA enclosures placed in line with KS-28 subwoofers ensure that sound fills the arena evenly and marvellously, with no feedback, reflection or dead spaces no matter where the listener is. The entire system is driven by four LA4X and twenty LA12X amplified controllers, the most powerful equipment available in the L-Acoustics family. To put the system to the test, guests were then treated to a 30 mins musical performance by the band “John Thomas & Friends”. John Ashley Thomas, one of Malaysia’s most in-demand drummers delivered a performance that filled the arena along with his bandmates playing the bass, guitar, saxophone, keyboard and a lead vocalist who hit all the right notes with her raspy vocals. John has performed with several international acclaimed artists, including A-Mei, Jacky Cheung, David Tao, Lo Ta-yu, Jonathan Lee. Moving from the classic funky R&B hit ‘Ain’t Nobody’ by the legendary Chaka Khan to delicate acoustic arrangements ‘Chinese Dude from Cheras’, an original composition by John Thomas & Friends as well as electro funk number ‘Chunky’ by Bruno Mars, the session proved the quality and the versatility of the system in transforming the energy of the musicians into musical reproductions of unsurpassable clarity. “The L-Acoustics K2 sound system has already debuted to rave reviews in our recent concerts, and the feedback has been amazing. At the recent sold-out Kenny G concert held here, I found that someone could enjoy the system from every single section in the arena. Our audiences can now hear the difference clearly, able to pick out every change in timbre, modulation in pitch or subtleties of cadence clearly as the musical wave sweeps and reverberates around our arena without a single note of dissonance. This is the best arena sound system that money can buy, and we have made this significant investment because we believe that our audiences deserve only the best and Arena of Stars is the only concert hall in Malaysia that has this system offering our audience the best sounds. We’ve found that over the years, artistes have started to demand more in terms of the quality delivered through the sound system and we’ve fulfilled that with L-Acoustics,” said Kevin. The L-Acoustics K2 sound system showcase at Arena of Stars, Resorts World Genting was supported by Tegas Broadcast & Multimedia Sdn Bhd – a leading systems integration service provider for the broadcasting sector in Malaysia and long-term logistics partner of Sennheiser Asia. Tegas Broadcast & Multimedia Sdn Bhd offers a comprehensive range of broadcasting services and solutions across Promotional Tools, Planning & Design, Network Management & Maintenance, Onsite Systems Integration, and Technical Support. Guests at the event included notable concert organisers such as Unusual, Biz Trends, JS Entertainment, IMC Live and Macpiepro.